For our local climate here in the Florence area we have moderate heating needs and a heat pump is an energy-saving alternative to furnaces found in colder climates. As we explained in our article on air conditioners, these units act very much the same way are your refrigerator for air conditioning purposes. A heat pump actually moves the air from the outdoors through coils which warms the air. In this area the most used heat pump is an air-source unit which will transfer the heat from your home to the outside and back again. Most homes in our area heat with electricity and a heat pump helps to save the amount of electricity you use for heating purposes by as much as 40%. However, this efficiency drops in cooler climates which makes them unsuitable for colder areas. Since we have a large population of transplants from these colder climates, many people are unfamiliar with a heat pump and how it works. We are often asked by our customers if they should turn down the thermostat during the day when they are not at home as this was a common practice with furnaces. This will actually cause a loss in efficiency as the unit has to work longer and harder to reach the desired room temperature. You will save money in the long run by setting it on a temperature that you can live with and putting on a sweater or blanket. You can gain additional efficiency by installing a geothermal (also referred to as water or ground source pump) heat pump. This type of unit transfers the heat between the ground or a water source and your home. This type of unit will cost more to install, however, they have a lower operating costs because they use a more constant ground or water temperature as opposed to the air temperature and will save money over time. You will need to consult a heat pump professional as these units will vary depending on the subsoil, the size of your lot and landscaping. There is a relatively new type of heat pump on the market for use in residential systems and is referred to as the absorption heat pump or a gas-fired pump. This type of unit actually uses heat as its energy source and is usually gas driven. Heat pumps are manufactured by a wide variety of companies. 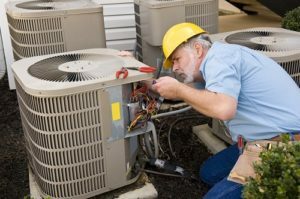 Make sure you ask about service of the unit before you install or replace your heat pump. Many units will require that the company that installs the unit also services the unit. This can lead to higher than expected cost of maintenance. Florence HVAC Experts technicians are certified in more than one type of heat pump. Call them for installation, price comparisons or maintenance of your heat pump.